Considering getting a bespoke hat made? 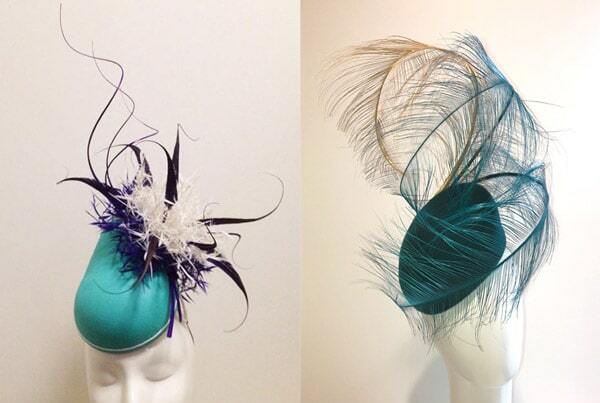 We have some very talented milliners on Millinery Market who would love to help bring your vision to life. Below you will find sample photos of their work and an overview of their style and experience to help you select a milliner to work with. 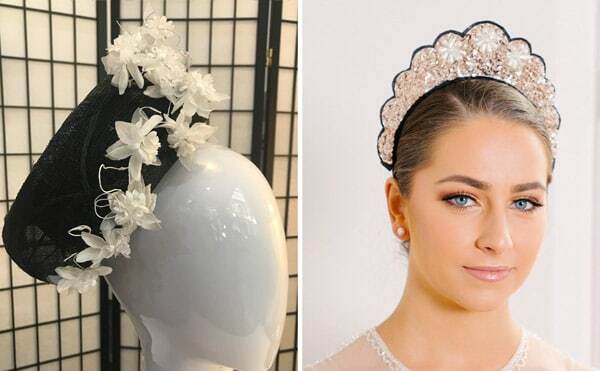 If this is your first time getting a bespoke piece made, check out Part 3 of the Ultimate Millinery Guide for some tips and advice. 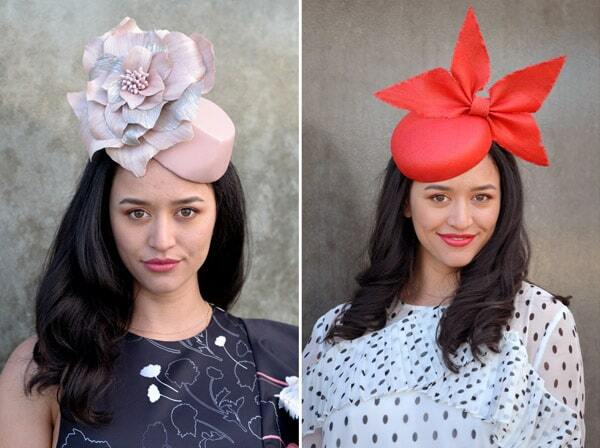 If you’re a milliner and would like to be featured, email hello@millinerymarket.com.au to find out how. 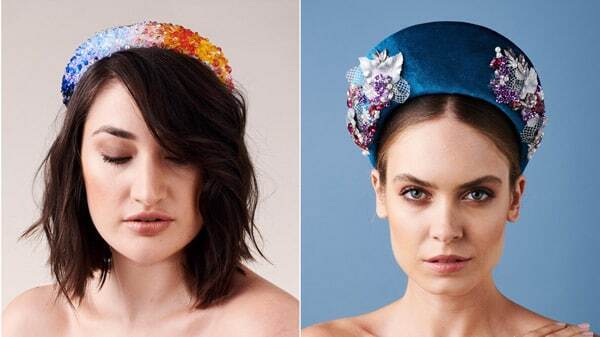 Claire is a self taught milliner with a background in fine arts and fashion styling. Claire made her first hat for a sewing competition when she was 11. 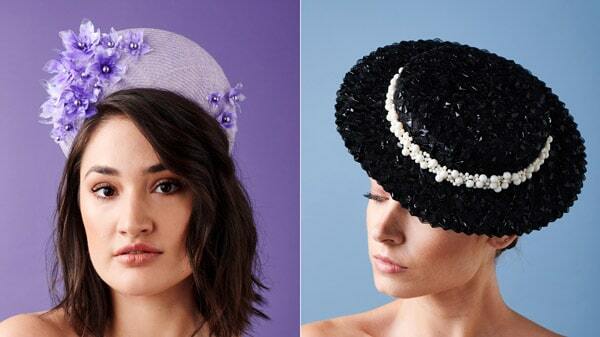 However her commercial millinery journey began in 2011 when she saw a gap in the market for millinery that combined on trend style with function and affordability. Claire’s signature style is modern and on trend while perfectly balancing a fresh fashion forward approach with comfort and wearability. Her ready to wear collection is a wide broom but carries her clean unfussy style across all of her designs. Claire is renowned for the styling advice she offers to her clients. Claire’s impeccable taste and eye for balance is generously afforded to all her clients. Claire’s speciality is providing one of a kind stand out millinery at a more accessible price point. Claire’s work ethic and customer service is highly regarded- always willing to go the extra mile for her clients. Claire’s work has been awarded countless millinery awards and adorned many an award winning ensemble. Most notably this year the winning sash at the 2018 Kentucky Derby Oaks. All ready this year Claire’s clients have won over 12 sashes with the Spring season underway there will undoubtedly be more to add to the success. Ready to wear pieces: $170 – $240. Bespoke pieces: $185 – $300. Formal training with Rebecca Share, Jane Stoddart, Peter Jago, Serena Lindemann, Carole Maher, Rose Hudson, Elaine Mergard, Amanda Macor. Plus five years with Hat Academy. 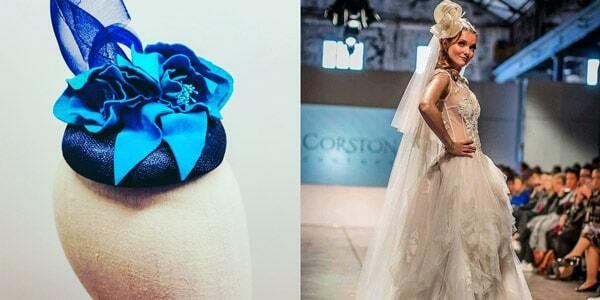 Started creating Millinery in 2013 – 5 years experience. My millinery style is mostly understated elegance but I also love to do large artistic pieces as well. I specialise in hand blocked perchers, winged pieces, boater hats and the use of alternative materials. My clients regularly win Fashions on the Field. I was a finalist in Brisbane Fashion Month 2017. I am about to do my third runway show. My average price for a bespoke hat hand blocked and hand stitched original is $250 – $400. Started creating Millinery in 2005 – 13 years experience. 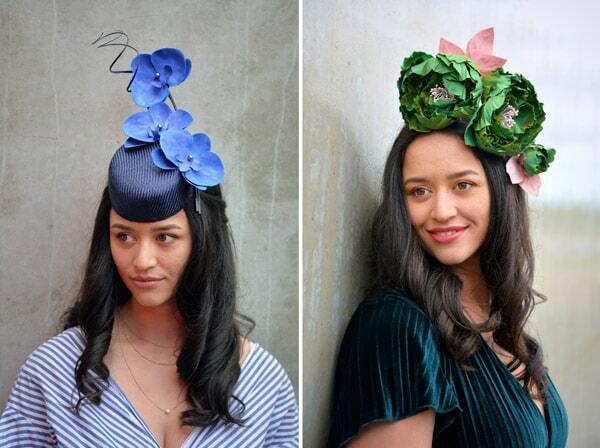 Creating for my brand Crazy Teapot there is signature feminine aesthetic to my millinery style with an eclectic mix of modern/ innovative designs and nods to vintage eras of the past. I love working with a range of materials, some of my favourites for Spring are sinnamay, straws, braids, textiles such as silks, laces and leathers for flowers and trims. I am always on the lookout for new materials and technology to work with and experiment with such as vegan textiles like @Pinatex, thermos plastics like EVA foam and even 3D printing. I’ve only started entering Millinery competitions in the last year. My clients have won multiple Fashions on the Fields awards over the years. My home based studio is on Brisbane’s Northside at Bracken Ridge and available to see clients by appointment. Prices for my pieces range from $150 for something simple thru to $550 for a complex hat but average price is between $250-$350. Prior to starting my journey in Millinery, I was involved in Calisthenics for over 25 years with designing costumes and headwear. I was self-taught and wanted to learn professionally. Since graduation in 2015, I have been a professional Milliner for 3 years. I pride myself on bespoke and sophisticated headwear. 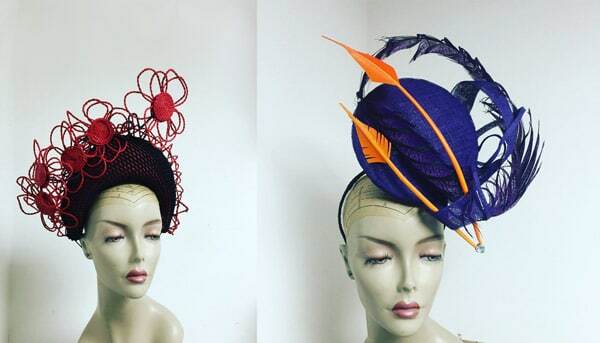 I specialise in creating custom-made hats and headwear for all occasions, I have a particular interest in the racing carnivals around Australia and Internationally, also bridal wear, mother of the bride, wire work and beading to name a few. I always like to keep up with the trend, but also enjoy being individual! Boaters are always a favourite, also Bretons/Halo’s, and Beret’s. I enjoy going out the box and try different styles and shapes. I enjoy working with pressed metal and metallic flowers incorporating these into headbands and on hats. 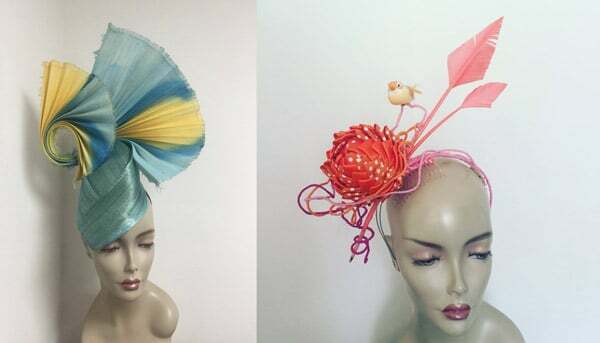 Moore Millinery Designs has won a variety of awards, with my pieces entering Fashion on the Fields around Australia, New Zealand and Ireland, winning entries including Derby Day 2015 and Adelaide Cup 2016. Country races winning entries including: Geelong Cup, Gunnedah Gold Cup, Clare Easter races. 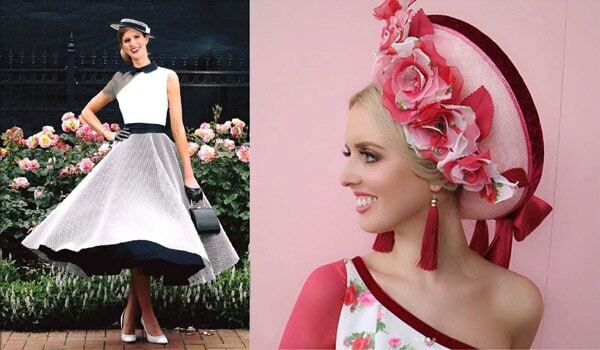 The winner of Adelaide Cup 2016 wearing Moore Millinery Designs creation went on to represent South Australia in the National Finals Fashions on the Field held on Oaks day during the Melbourne Cup Carnival 2016. This headpiece and outfit combined successfully won the prestigious Title of the National Winner for 2016 Fashions on the Field. 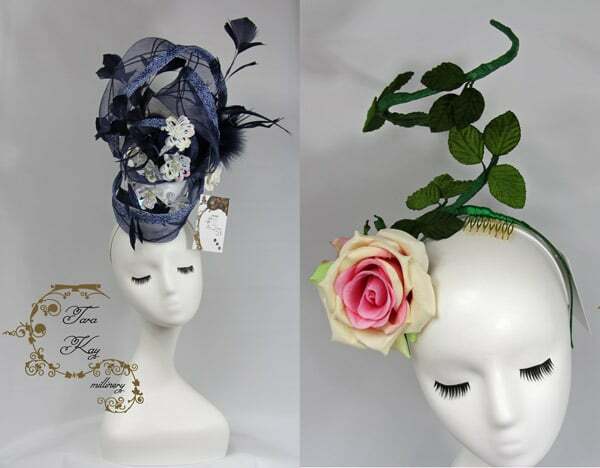 I also enter individual competitions including: The Millinery Association of Australia competitions, Royal Melbourne show (winning numerous awards) MIMC (Melbourne & International Millinery Competition- placing top ten two consecutive years), Hattember (Placing in the top 10). Average price for a bespoke piece is between $400 – $600. MSIT Level 3 Millinery Course, Sessions under Rebecca Share, Ex Royal London milliner Ian Bennet, Two international millinery conventions and a London Hat week. Started creating Millinery in 2010 – 8 years experience. 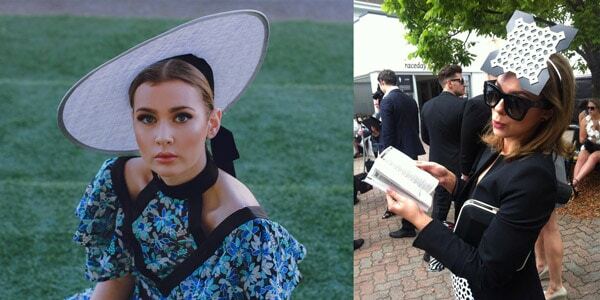 Large brims, Dior & D&G inspired shapes, fashion forward but always elegant, seamlessly styled to compliment the whole outfit. 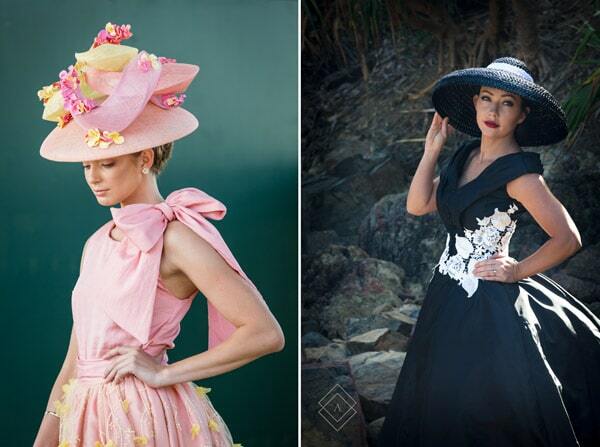 Large brims, 3D pieces & full service styling. Featured on the runway at 2018 Spring NYFW. Various best dressed & best millinery in FOTF parades around the country. 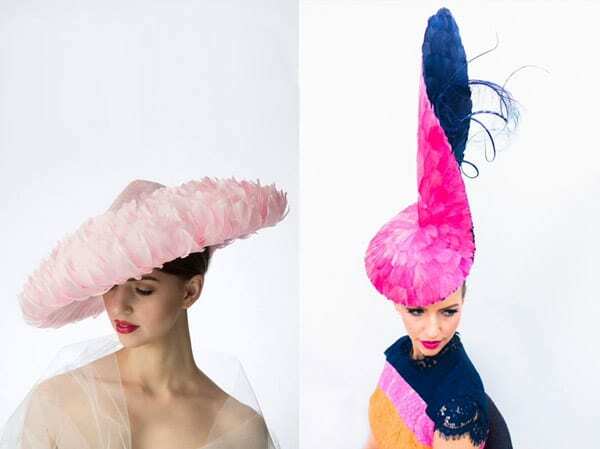 Featured in Harper’s Bazaar, British Vogue, Australian Vogue, Elle and Marie Claire, Marilyn Van den Berg Millinery has been worn by celebrities and racing royalty. Technically nearly 7 years (since 2011), but my Mum (Victoria Henderson) has been making headpieces for over 20 years and I was taught by her from a young age. 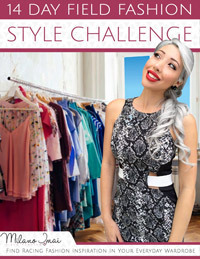 I would describe my style as vintage with a modern twist. I love flowers and they are seen in many of my pieces. I love the elegance of a simple, well crafted headpiece. My favourite material to block would have to be leather but I also love working with silk and traditional flower making techniques. Rosey and Jenelle enjoy different textures, fabrics and techniques that allow us to create bespoke and innovative headwear. It is important to us that we are malleable and draw inspiration from current trends and clients personal style. We favour clean, refined and modern silhouettes. Leather flowers, silk abaca sculpture, embroidery and beading. 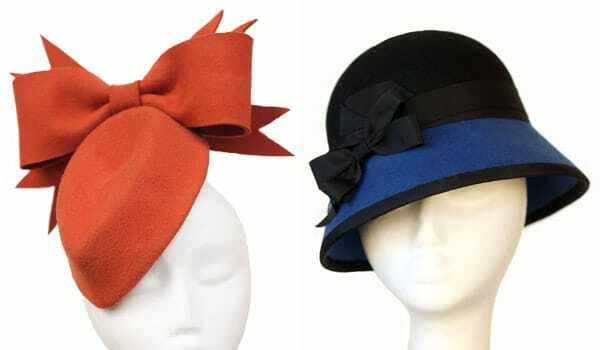 Trained and accredited at Kangan Batman Safe – Richmond in Millinery (cert 2&3 Headwear/Millinery 2008 &2009). 3 Year Apprenticeship and full accreditation in Floristry – Majorie Milner (cert 2,3 and DIP 2006-2009). Multiple refresher courses and online courses to learn and trial new materials and ongoing trends. 10 years of experience in Millinery – 3 Years of Launching my own brand and practising Millinery under my own name. 12 Years floral experience – which I believe goes hand in hand with millinery and keeps my skills and hands nimble. It also allows me to always remain creative and inspired being constantly in a creative environment. I am a black and white girl through and through. I love using luxe fabrics such as leather, vintage handwoven straws, freshwater pearls, veiling and more. I find inspiration in the natural world around me such as the flowering camellia bushes and the budding, blossoming trees in the springtime. Monochromatic palettes sing to me with this year also being influenced by French Provincial Stylings and old world screen sirens such as Grace Kelly and Audrey Hepburn. A Milliner at heart who puts time and effort into each work of art. Every stitch is hand sewn, every petal is hand cut and shaped. 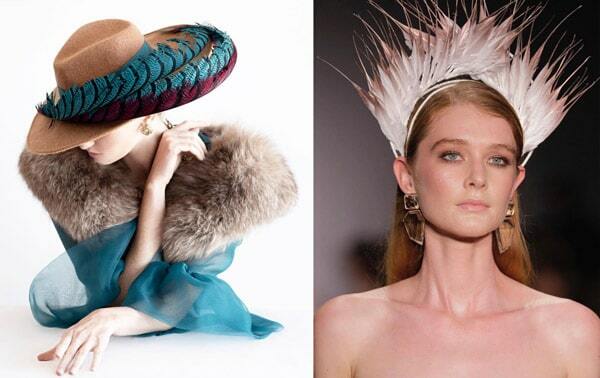 I honour the Millinery art form whilst creating modern and striking designs for the fashion elite. Custom orders from $200. Ready to wear range begins from $145 through to $500. Varient depending on materials, time and overall aesthetic. Studied for a year at the Melbourne Fashion Institute in Melbourne. I enjoy making Millinery that is feminine, with an understated elegance. I use bold colours and a mix of traditional and modern trimmings. My specialty would be including Intricate beading on my work. Headbands and crowns are my favourite shapes to use and I love applying pearls and crystals to create a truly unique piece. Since starting on my millinery journey I have attended many workshops with various master milliners to fine tune my skills as well as completed many online classes via The Hat Academy. Some of my teachers have been Elaine Mergard, Waltraud Reiner, Rebecca Share, Jane Stoddart, Catherine Kelly, Ian Bennett, Peter Jago and Phillip Rhodes. My first millinery workshop was in 2012 with Elaine Mergard and I’ve been making and loving hats ever since. I like to vary the look and feel of all my pieces, but they generally all feature a vintage feel with a modern spin, whether it be a trim or a the shape of the hat that receives the contemporary stamp. I work with a variety of materials, lace, leather, felt, silk, feathers and straw, but I do particularly like sinamay. It’s an amazing material when used well, it’s very versatile and I enjoy using it for both blocking as well as trims for my hats. 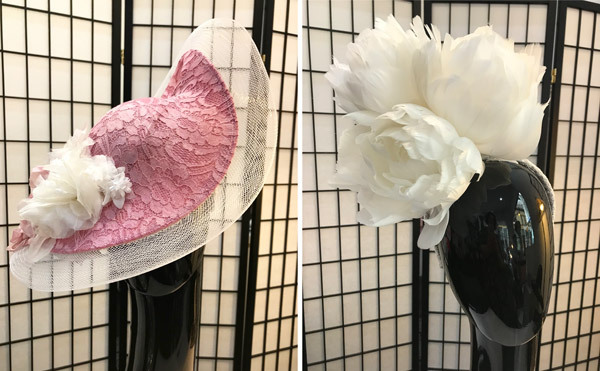 Over the years I have made many hats for ladies entering racing fashion competitions, many of which have been successful in placing. I have won ‘Champion Millinery’ at Toowoomba Royal Show with one of my leather headpieces. One of my commissions was worn at the Queens Garden Party at Buckingham Palace. Studied Fashion Design (3years full time) at Canberra Institute of Technology, Cert IV Millinery Canberra Institute of Technology, Courses in Theatrical and Historical Millinery with Jane Smith London. 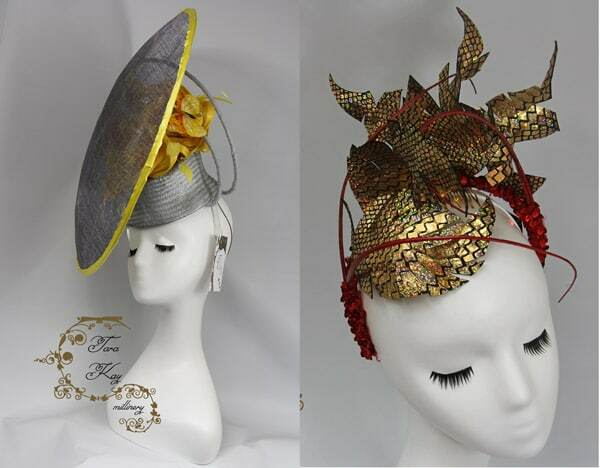 Many many courses with International Acclaimed Milliners. Started creating Millinery in 2002 – 16 years experience. My brand is fun, feminine, bold and creative. My creations are wearable art and can be left on display long after the event is over. Combining traditional millinery techniques, innovative styling and insistence on top quality, my pieces speak for themselves. Love feathers but inspired by everything. 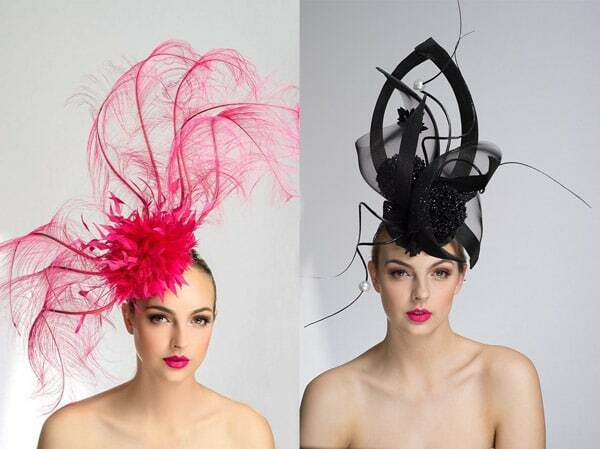 Finalist Melbourne Cup Carnival Millinery Award 2014, Winner Melbourne Cup Carnival Millinery Award 2015, Best Hat Kentucky Derby 2017. Prices vary depending on materials used and hours. Attended international millinery forum wagga wagga 2 years. Hats off Convention in Brisbane 1 year. 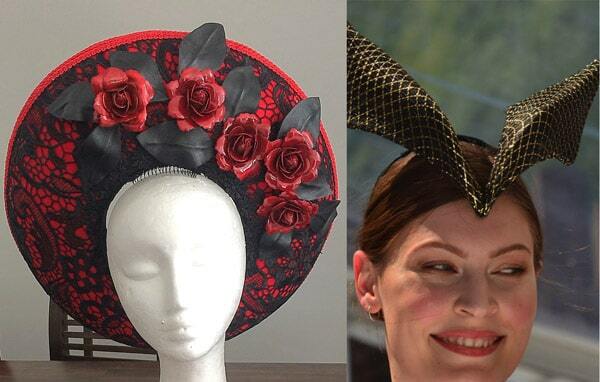 Started creating Millinery in 2014 – 4 years experience. 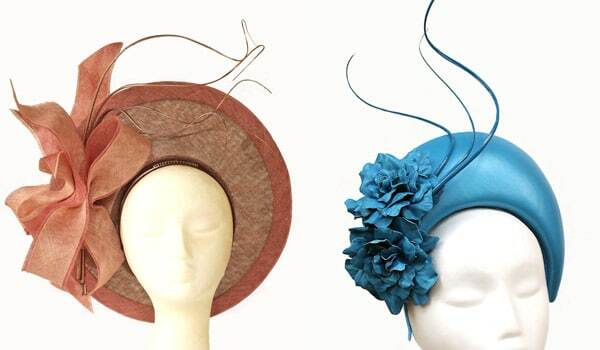 Abstract, contemporary and sophisticated millinery for race goers and bridal. Bridal headpieces, veils and accessories, Race headpieces, Guipure Lace, swarovski, sinamay, straw, felt, silk abaca and leather. Runner up and Finalist 2015, 2016, 2017 Abia Bridal Accessories. Winner 2018 – Bridal Accessories – Bridal Choice Awards. 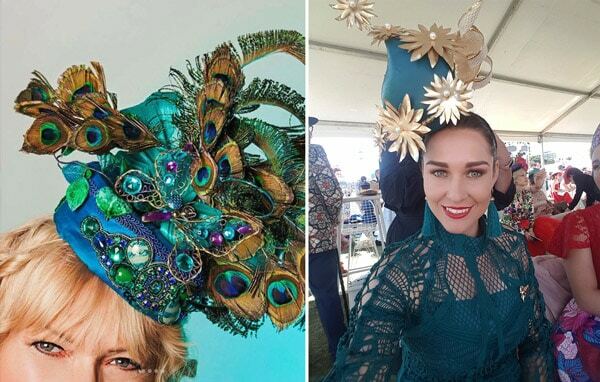 Finalist – Oaks Day 2018 Millinery Award … current year. Winner Best Millinery at various picnic races. I am based in Orange NSW where I have a studio, by appointment only at home and I have an online website and shop. I sell nationwide and globally. I have my pieces available at stockists at Ryde and Millthorpe. Pop up shop of my headpieces for sale at xterrace pop up shop Kensington, London UK. 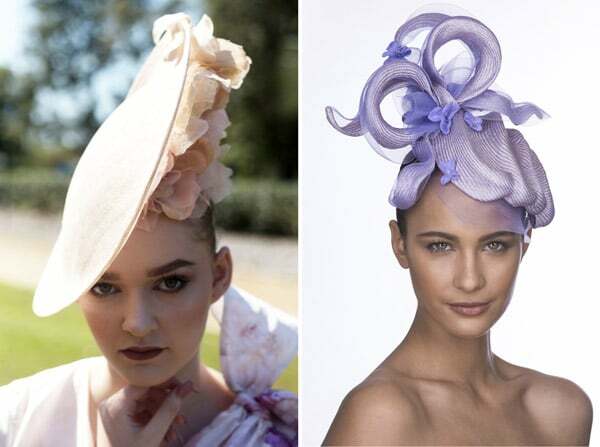 A qualified art and design teacher, I have trained in millinery in London, France and Australia. Started creating Millinery in 2012 – 6 years experience. Prior to that, I had over 40 years experience as a sculptor and textile designer/teacher. 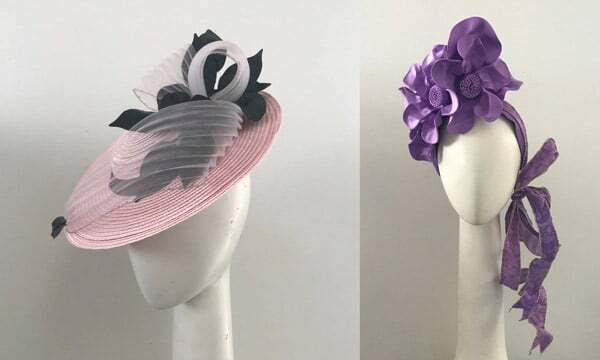 I love to make hats that are classic in style and materials, including cloche and elegant 50s style pieces suitable for racing and even bridal, always with a twist of different style. 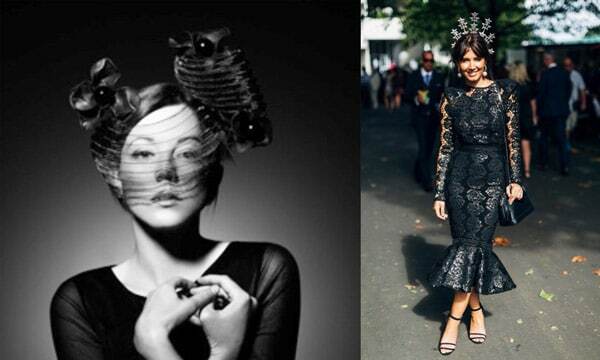 I feel people need to wear a headpiece that suits, not just because it is ontrend. I love to use vintage fabrics and hat blocks to create unique pieces. I also custom design many of my blocks so that they are totally unique. Each piece I create is a one only headpiece. 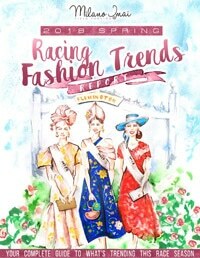 I create spring racing as well as seasonal hats for summer and winter. I attended Waltraud Reiner’s Winter School in Rockhampton 2016. Impressed by my hand stitching, Waltraud invited me to Melbourne. I worked in a studio with Waltraud Reiner, Katrin (of Chaperon Hats), and Tamami from Japan for almost two months. Together we created an incredible collection of hats, “Talking Hats” where we explored the process of making these hats through metaphors. I spent almost 2 months in Waltraud’s studio where I learnt an incredible amount of skills. Since then I have attended Waltraud’s Summer School and Winter School every year where I have become a part of a very special family. Started creating Millinery in 2016 – 2 years experience. I would describe myself as a minimalist in design. I’m not one to ‘decorate’. I would rather show off technique. For example, the hard work that goes into blocking a shape to make all of those edges smooooth, and say, the passion of sculpting a beautiful curve. Playing with ‘line’ makes my mind dance. I tend to go through phases of playing and experimenting with certain materials at a time. In Spring 2017 I was obsessed with Jin-Sin, this Spring I’m all about Parasisal Straw! Continued learning and having a wide range of skills to work with many materials is the goal! At this stage Moh Deest Millinery hasn’t entered any Millinery competitions but is hoping to in the near future. 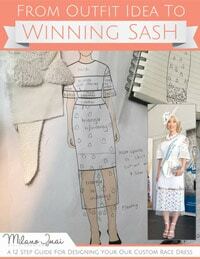 However, clients have had the pleasure of being sashed in fotf in ‘Best Millinery’ and ‘Best Dressed Lady’ categories. I am currently based in North Queensland, working from my little in home studio and mainly selling online. 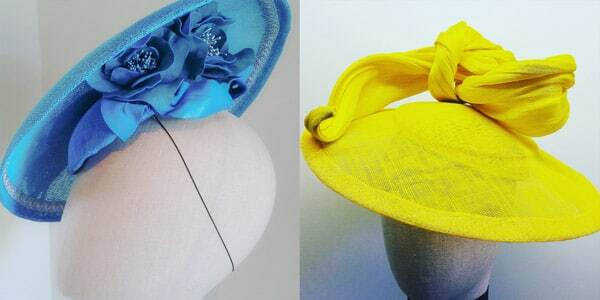 I am predominately a self-taught milliner who has been guided by many vintage millinery manuals and have refined my millinery skills by attending short classes with world-renowned and Australian milliners including Ian Bennett, Neil Grigg, Serena Lindeman, Janelle Rayner and Lorraine Gill. 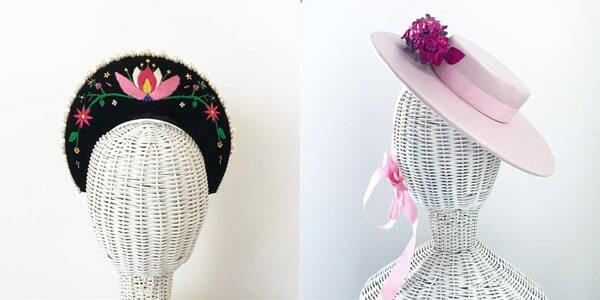 I have been making Millinery since 2009 – 9 years experience. Prior to becoming a Milliner I used to be an exhibiting artist/painter. I would describe my style as a mix of classic elegance and clean modern lines. I specialise in feather and silk flowers and love to combine these with a beautifully blocked straw or leather base. I am based in the gorgeous tropical city of Cairns in Queensland. My bespoke pieces start at $250 and go up to $600 depending on the materials used and difficulty of the design. 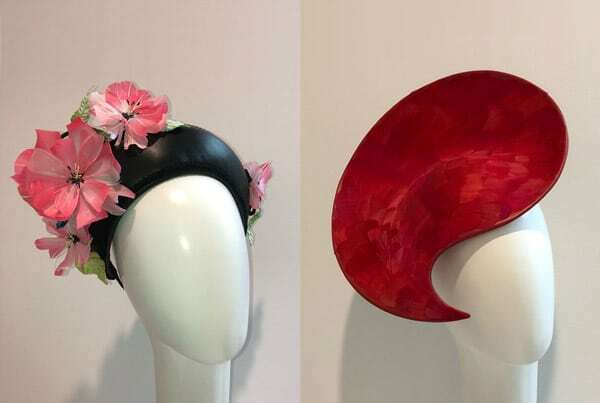 I am largely self taught, then I began classes with Riverina Community College and progressed to attending International Millinery Forum classes, weekend workshops with a variety of Master Milliners and online. I am an artist as well as a Milliner, so I tend to find that my design style comes naturally with respect to line and balance, and my works tend to have quite a sculptural aspect to them. I enjoy working one on one with tutors as this allows me to really explore the technique I am developing, but the real magic always happens when I am at home in my studio. I began making hats in 2010, but have been creating artistic works since 2007. Our whole family is artistic, so it was a strange thing that I discovered later in life why I always felt at odds with myself. My artistic brain has been creating since the day I was born! I would describe my work as organically structured. They all begin quite structured and gradually grow a life of their own and burst out of their own confines. I seem to bring a small amount of chaos to all my works, perhaps this is a refection of my own personality. I have the most fun when I am given a pile of random things and asked to make a hat. I love repurposing materials, and pushing myself to experiment and be resourceful. I particularly love working with felt and feathers, as they are soft and provide a sense of luxury. 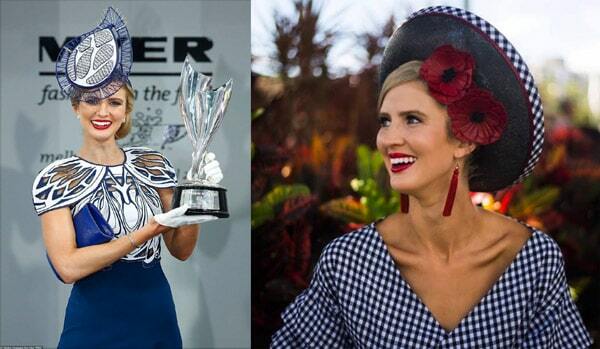 My hats have won many Millinery and Lady of the Day awards across regional Victoria and NSW and Queensland. I have won the Champion Award at the Wagga Show, as well as Most Successful Exhibitor Award. My leather gum leaf hat won the peoples choice 2014 award in the International Millinery Forum. My hats routinely make the final in the Henty Fibre Fashion Awards. I am based in Regional NSW, Wagga Wagga. My Average prices range from $350 to $600, depending on the materials and work involved. I started enrolling in millinery courses at the Hat Academy and am planning to get my certificate and join Millinery Association of Australia. As I am very new to this, I am still finding myself. Leather crowns would be the one if I must choose. But as I said before, I am stil learning.